21 Plus Telecom - Why Samsung? Samsung systems offer a truly flexible solution for any business, whether you are a large multi-site headquarters or a small office, the OfficeServ or Ubigate iBG series can be scaled to suit your needs without compromising on any of the features. From the OfficeServ 7030 right through to the OfficeServ 7400 and the Ubigate iBG1003 to the iBG 3026 all features remain the same. 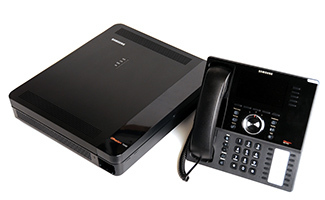 The WiFi, OfficeServ Connect or DECT products offer an integrated mobility solution, allowing for users to be on the move but still in contact, delivering a more efficient company. Bringing the other powerful functions of the Samsung product range which include ACD capability, Voice messaging, Desktop integration and Presence as well as many other applications. The Samsung product range can be tailored to any business. The OfficeServ 7000 range allows you to connect up to 1000 systems giving seamless communication no matter whether these are down the road or across the globe. For people who work outside of the office the remote working capability of the OfficeServ allows you to work from anywhere with an internet connection either by using the OfficeServ Softphone or one of the award winning IP handsets. We have achieved simple plug and connect for the end user making the need for complex configuration and IT support unnecessary. The Ubigate iBG range of data centric products provides secure data networking connections for site to site and remote workers for data as well as voice communications.